Originally published some years ago as What Are Piano Lessons For? this is my manifesto on the purpose of piano lessons. 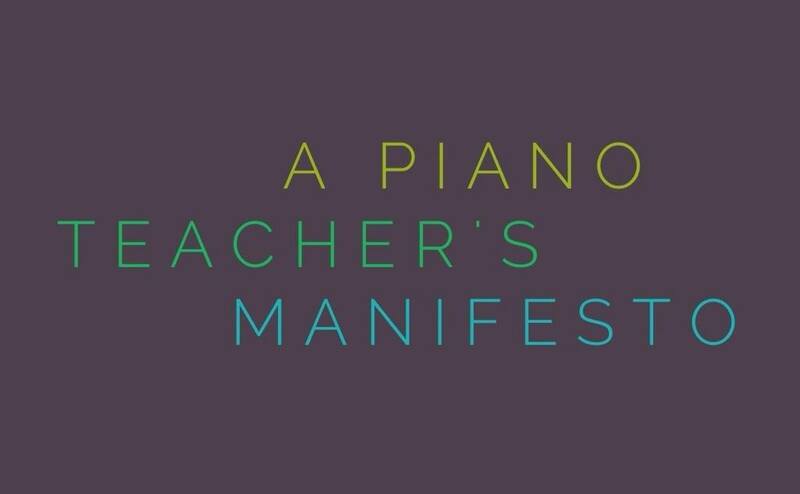 This is a manifesto that emerges from my experience, that reflects my values, and that frames everything about my piano teaching, about my writing for piano teachers, and about my composing for piano students. 1. Piano lessons are for learning how to do cool stuff on the piano. 2. Piano lessons are for learning what the piano can do so you can do whatever you want on it. This might sound like a repetition of the ‘cool stuff’ idea in point 1, but while ‘cool stuff’ teaches you what you can do on the piano, this second point has a completely different focus – it’s not about performance per se, but about the ability of the student to express themselves freely through the piano. This might manifest as a student composing new music, or as the student creating variations on the music they are learning, or as the student finding their own new music to learn, or as the student playing familiar music without requiring a score. ‘Learning what the piano can do so you can do whatever you want on it’ means a developing autonomy, an increasing sense of ownership of the instrument and its role in [your] life. 3. Piano lessons are for understanding other people better. Playing the music composed by others allows students (and performers) to inhabit someone else’s emotional and ideational world, and learning to play the music of others is an even more intimate encounter with the way other people think and feel. Playing music with other people gives an insight into the way they approach interacting with others, how they express themselves, how patient or impatient they are(! ), how curious they are, how their minds work in all kinds of ways. Each of these ways of interacting with others can result in deep connection with others, whether they are peers, mentors, or people the student has never met. 4. Piano lessons are for understanding yourself better. This happens in many ways, but I want to highlight two. Music connects directly through to your emotions (even if you are just wandering through a shopping centre, and certainly in a scary movie). But that emotional access is multiplied many times over when you are playing a musical instrument; the music is in your body – your body is making the experience you are hearing, your fingers are finding ways to excite, soothe, enrage or engage. When you take piano lessons you learn about what kinds of emotions you want to express, you learn about the ways you can change your emotional reality, you learn about how your choices impact on the emotional states of others. The process of learning to perform music (especially on the piano where the performer needs no accompaniment) is a particular kind of discipline that requires a deep acceptance of imperfection while still striving for excellence: no performance is flawless, there will always be new ideas for improvements and change. No one else is to blame for less than wonderful performances, no one else can take credit for performances that shine. The student learns much about themselves in terms of how they relate to perfection/imperfection, how they face challenges in an emotional sense, how they face challenges in a practical sense, how they work toward long-term/medium-term/short-term goals, and a myriad of other truths about their natural proclivities regarding how to define success and failure. Parents sometimes think thisaspect of piano lessons is so important it alone makes taking piano lessons an imperative. 5. Piano lessons are for understanding the world better. Music is a genuinely direct way of connecting students with other times and other places. It’s quite extraordinary how effective music is in this regard. And while listening to music provides a passive, touristic understanding of the world, actually playing that music means that you are complicit in this wider world – you’ve participated in history, you are experiencing the cultures of other continents and communities. 6. Piano lessons are for exercising your body, your intellect and your emotions all at the same time. It has been demonstrated that playing the piano will raise your IQ by around 7 points for as long as you play the instrument (you’ll lose those points if you stop playing for months/years), and the reason for this is that nothing else in this world engages so much of your brain at the same time as playing a musical instrument. We didn’t know this in the past, but advances in neuro-imaging mean that we now do know which parts of the brain are at work when a musician is playing an instrument and, while in many activities in life there is a dedicated region of the brain that processes that activity, it is evident that the whole brain is involved in music. In short, the brain is musical – all of it. And when you play an instrument you are using that whole brain. 7. Piano lessons are for changing who you are. All the points listed above add up to an experience that allows you to express yourself [increasingly] freely, learn about yourself and others as well as about both the world around you and the world beyond your horizons. This will change you. Further, with each new goal that you attain and each new challenge that you conquer, you will find yourself looking at other, non-musical goals and challenges in a different way. This goes far beyond believing in yourself, this goes to knowing that you can achieve what you set out to do. 8. And finally, piano lessons are for joy. The joy you feel playing the piano, the joy you feel playing better and better each week/month/year, the joy others feel hearing you play, the joy you and others experience playing together. The joy of discovery, the joy of achievement, the joy of the raucous, the joy of the sublime. If piano lessons aren’t for at least some of these joys, then what on earth are they for? Just pondering on your inclusion of contrary motion scales. I never teach these unless the child is desperate to do an exam. To me contrary motions scales are a party trick for examiners, something thought up by a sadistic non-performing head of department in a long-forgotten music school in the country of Far Far Away. Contrary scales are very hard to do well (I have rarely heard anyone do F minor fluently) and therefore useful for deducting marks from uppity candidates in piano exams. I joke that when asked for contrary scales students should produce some juggling balls and entertain the examiner for a few minutes. At least that way someone would be having fun! Have you in your entire career as teacher, performer or listener ever heard any concert repertoire that requires the pianist to play contrary scales in all 24 keys? I can’t see any point in trying. I would rather ask the student to learn 24 new pieces. I’ve never heard a whole lot of things in the concert repertoire that I ask my students to do, and I have to confess that the concert repertoire isn’t primarily what determines what happens in my piano lessons! There is truly nothing more satisfying to the body and intriguing to the ear as a pianist than playing a scale-pattern that is symmetrical (black notes/white notes). E Major is a straightforward example, but I also enjoy playing C Phrygian mode in contrary motion for the same reason, and there are a multitude of patterns (named and unnamed) that are a joy to execute! Absolutely love this article. I’m heading back to the top, to read it again! Wonderful.